Note - This volume is also available in a hard-bound edition. Click on the link to go to that page. The Map Guide to Swiss Parish Registers series is an out-growth of the very popular Map Guide to German Parish Registers project, which is still in process, but nearing completion. Over the years, we've been asked by numerous parties to extend the project to cover other German-speaking European countries. We did that with the publication of Map Guide to Luxembourg Parish Registers in 2016. There are 26 current cantons in Switzerland. Historic Bern is covered in the first two volumes of this series, and makes up two of those 26, as the current Canton of Jura is in historic Bern Canton. Volume three of the series covers Canton Zürich, Volume four deals with Canton Fribourg. Canton Aargau is covered in the fifth volume. Switzerland has 26 Cantons. Many of them are small, so we plan to publish guides to multiple cantons in some of the volumes. For this reason, we expect the entire series to be under 20 volumes. Map Guide to Swiss Parish Registers - Vol. 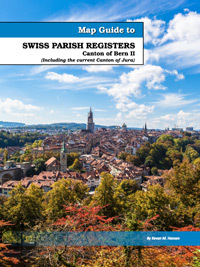 2 - Bern II is the second of two volumes covering Canton Bern. The first volume (Bern I) covers the rest of historic Canton Bern. Click on the link to go directly to that page. Unlike American genealogical research, where the place to search is usually a civil registration (city, county, and state), European research is usually related to an ecclesiastical jurisdiction. In 18th and 19th century Switzerland, one must search the parish registers for births, christenings, marriages, deaths and burials. The historic boundaries for the Swiss cantons and amtsbezirke are quite well defined, and this volume lays them out in map form. Listings are given for both Catholic and Protestant parishes, along with what records are available and where to access them. Contact information, and the municipalities covered by each parish is found, making your Swiss research much easier to accomplish. Identiﬁes the major online resources for Swiss genealogical research. Identiﬁes each canton with amtsbezirke (districts), and the municipalities, bauerten (farming coalitions), and subsidiary locations. Visually identiﬁes church parishes within each amtsbezirk (district). Provides an overview of Swiss genealogical records. Identiﬁes neighboring parishes, just in case your ancestor may have gone to an alternate parish. Aids in conducting area searches, particularly across district and canton borders. Provides visual identiﬁcation of search areas in which to look for your family. Identiﬁes archives, repositories, and other resources. Identiﬁes important gazetteers and online dictionaries available to researchers.